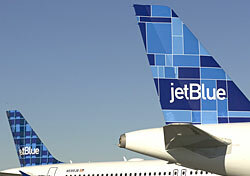 It hasn’t been a good week for JetBlue. First news broke that the airline allegedly stuck one of its passengers in the bathroom for a cross-country flight, and now this: The erstwhile low-cost carrier upped its change fee by as much as $60, to a new cost of $100 effective as of May 1. It was probably inevitable, because, hey, everyone else is doing it, but I expected better from the carrier whose whole advertising campaign is all about how much it likes its passengers. Apparently it likes exorbitant fees just a little more. Which leads me to wonder, if the low-cost carriers start operating the same way as the legacy lines, will there be any difference left between the two? Tasty blue potato chips only go so far when it comes maintaining customer loyalty.